Jane Boxall is an adventurous percussionist, working across diverse musical genres. She focuses on both rock drumming and art-music marimba, touring and recording as a soloist, collaborator and session player. Jane has performed in concert halls, art galleries, cafes, castles, kindergartens, hospitals, universities, forests and festivals from Rome to San Francisco, and Manhattan to France. 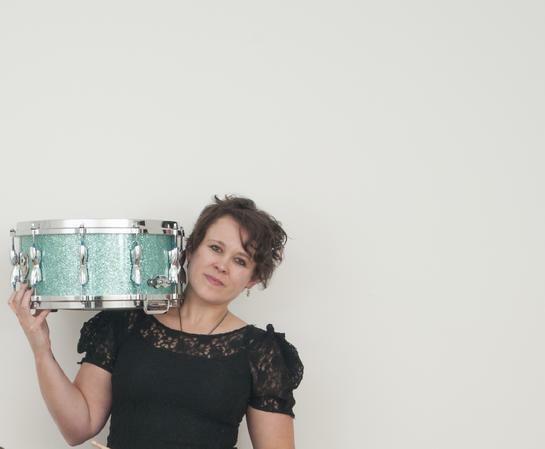 Born in England and raised in Scotland, Jane completed her BA and MA in Music at the University of York (UK), and her Doctorate in Percussion Performance at the University of Illinois. With pianist Rose Chancler, Jane is a founding member of Ricochet Duo; in 2011, Jane co-founded the non-profit music camp Girls Rock Vermont. Jane’s compositions for percussion ensemble are widely performed from Texas to Hong Kong; her studio recordings have received radio airplay across the United States, on the BBC and on the Dutch radio stations Concertzender and Radio Mona Lisa. Jane’s recordings of Nancy Van de Vate’s marimba compositions are released on the Naxos label. Jane has shared stages and bills with Bradford Reed, Sheesham&Lotus, Vernon Reid, Myra Flynn, Gregory Douglass, The Life and Times, Brzowski, Cage, The Slackers, Les de Merle and Danny Seraphine. Jane has appeared with the Vermont Symphony Orchestra, Guildhall Symphony Orchestra, Prairie Ensemble and the Vermont Contemporary Music Ensemble. In 2012, Jane premiered Garry Jones’s Concerto for Park Bench and Orchestra with the Event In A Tent Festival Orchestra – “I’ve never heard a park bench played so passionately,” stated the composer. Jane is deeply committed to the development of art music for percussion, and continues to seek and create innovative and adventurous programs. In 2013, Jane was the recipient of a grant from the Vermont Community Foundation, which enabled her to undertake the inaugural “Portable Percussionist” tour on foot from Canada to Massachusetts. Jane commissioned local composers to write “portable” concert pieces then hiked the Long Trail through the state of Vermont, stopping along the way to perform solo percussion recitals. Composer Dennis Bathory-Kitsz commented: “Jane Boxall's Portable Percussionist was a brilliant presentation. She held the audience spellbound with the simplest of materials -- rocks, sticks, pots, and even the zippers on her pack. One composition student later said, ‘My mind was completely blown. I have to re-think everything about composing’." Currently, Jane is touring internationally as a concert artist, session drummer and clinician. Jane plays and endorses Vic Firth sticks and mallets, Coe Percussion marimbas and District Drum Company snare drums.